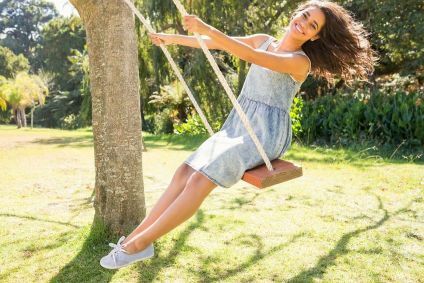 Do you remember swinging on a swing? And the fun of going higher and higher as you tucked your legs under on every backward swing, then thrusting them out on the forward swing? When our son was little, I recall that swinging was a learned skill. When we first put him in those bucket swings, he squealed with delight as we pushed him. Then he graduated to the big kid swing, where he learned the coordination skills to make the swing work on his own. It was exciting to watch him learn that each backward swing was not a retreat but a momentary opportunity to pump forward, even higher. He always enjoyed every part of his journey on the swing. I think of swinging as a good metaphor for life. It is so easy to focus on the things that are not working – situations where we feel we are stuck or have gone backward. In reality, those seemingly momentary retreats are nothing more than the preparation for us to swing even higher. The Course tells us “we walk to God.” What if we really believed that? We are not on a hopeless path wandering aimlessly around, we are on a mission. No matter how much our ego thinking tries to distract us with failures, insecurities, worries, and seeming disasters, we are still walking to God because in truth there is no other journey to make. This is our job now: To remember. When we are not feeling that sense of joy, that sense of contentment and purpose, we have forgotten our true vocation. Just like we needed to acquire the skills to swing, we need to acquire the truth that we feel we seem to have lost. It is time we practice joy through the gift God has given us in the Holy Spirit. Let’s not think that we’re abandoned when life feels like we’re going backward, not improving, or falling apart. Just like the swing’s preparatory movement back, we can then move even higher, forward. Remember, we walk to God and we have a Helper on this walk. Our Helper’s only purpose is to remind us of the worth and value that abides within us all. Now it’s time to go find a swing and take a joyous ride. As you pump higher and higher, remember any seeming backward motion is only a momentary pause. Our way is secure, and we are not alone. Think of all the issues that are causing you pain or concern, and then pump through them to the truth that you walk to God and you have a Teacher to lead you to that truth in every encounter. Enjoy the ride, you deserve to be happy. This is the Will of God for you. PS: If you don’t have the free gift below (the beautiful vinyl cling we sent in our current donation appeal), make sure you request one … or even two or more! It’s the perfect way to remember this truth wherever you are!